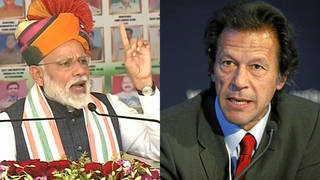 Carrying On a Legacy of Nonviolence: As India and Pakistan Draw Closer to the Brink of War, An Interview with Arun Gandhi | Democracy Now! It seems plausible India is preparing for a “limited war” to flush out Islamic militant camps in Pakistan-administered Kashmir. But Pakistan has vowed to retaliate if attacked, possibly with nuclear weapons. Meanwhile, President Bush announced Thursday he’s sending War Secretary Donald Rumsfeld to the region next week. Arun Gandhi has devoted his life to building on the legacy of nonviolence of Mahatma Gandhi. He is the co-founder and director of the M.K.Gandhi Institute for Nonviolence, in Memphis, Tennessee. In 1960, he founded the Center for Social Unity, an economic self-help program for the untouchable caste. Azan Nan Kpe–Angelique Kidjo, Aye (Mango Records CD).